Like all other appliances, AC units have their own quirks and weaknesses. They help us feel more comfortable in the dog heat of summer, and usually our AC units and heating units are 2-in-1 for most modern houses. Keeping your home at a comfortable temperature is not easy, specially when you live in an in-land state that doesn't have the temperature-regulating effects of the ocean. That is why Charlotte AC repair companies are so important. 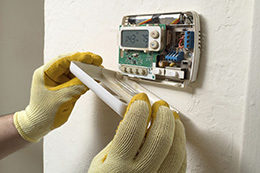 Heating and air units never seem to break down at acceptable times. However, we can help get your AC back on track. Most AC units suffer from the same basic problems. Two of them are the most common inconveniences that we suffer from, but Charlotte AC repair services have seem then enough times that we know the basic fixes for them. After a while, most AC units start to not cool off as well as they used to. This could be a series of problems, but usually instead of it being a severe problem that you will need a Charlotte AC repair company for, you can fix it by wiping off the filter or replacing a few easy-to-get pieces. Another big problem is having a frozen AC unit. It seems counter intuitive that the unit that is meant to cool down your home ends up freezing itself! Usually this could be a problem with the filter, and it may just need to be wiped down because it’s too dirty. Any other problems can easily be fixed if you give us a call. Let us know what your unit is up to – we’ll take care of it!